Emerging from his victorious stint at the hit South Korean survival reality show, “Produce 101”, and highly recognized for his fame online caused by his swoon-worthy performances, PARK JI HOON is now beyond ready to own the spotlight as he takes off to Manila for his first ever Fan Meeting Tour. With a whole lot of heart-stopping surprises and performances matched by his undeniably enchanting looks, Park Ji Hoon is expected to capture the hearts of every fans, the Filipino MAYs. 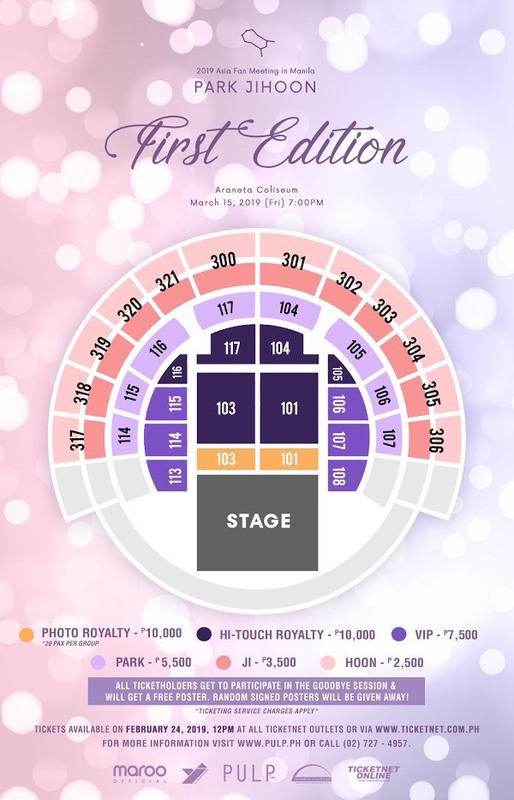 Fall in love with him at 2019 PARK JI HOON ASIA FAN MEETING IN MANILA “FIRST EDITION” that will take place on March 15, 2019 at the Araneta Coliseum. Show starts promptly at 7PM. Get your tickets starting February 24, 2019, 12PM at TicketNet outlets nationwide and online via www.ticketnet.com.ph. All ticketholders are eligible to join the GOODBYE SESSION with Park Ji Hoon, get a free poster & randomly win a signed poster! More details on the goodbye session will be also announced soon! This show is brought to you by Maroo Entertainment, YJ PARTNERS and PULP Live World.